May is the month of roses here in the Rosehaven Cottage gardens, particularly in the front garden where most of the rosebushes reside. Over the next couple of posts, let me take you on a photographic tour of our front gardens in all their May splendor. All the color makes this one of my favorite times of the year. 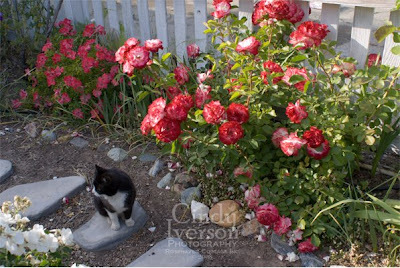 Above: Oreo, the garden kitty, sits on the stepping stone path between the My Fifi rose (left) and the Cherry Parfait rose (right). Above: The Irish Creme rose is a rose that loves cooler temperatures so it does better in the shadier part of the front garden. Above: This lovely rose lost its name tag, and I have been unable to reidentify it properly. Anyone recognize it? It looks a lot like my Angel Face rose that it the same age but not as ruffly. I think it had something like "mystic" in the name. 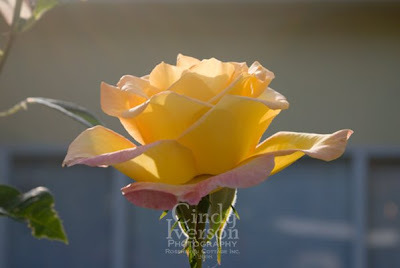 Above: The Gold Medal rose seems to glow in the sunlight. Gorgeous. I'll be it smells heavenly out there. Is the rose a David Austin or Heritage rose? I have a book about roses I bought in England. I'll look for a 'mystic' something name. I inherited 'Le Reine' when I moved here last year. Have you ever seen it blooming? It has 'circular' blooms. 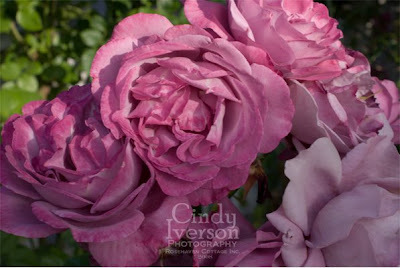 I posted photos from my visit to the Ojai Valley Lavender and Roses gardens last week. I was in scent and sight overload! 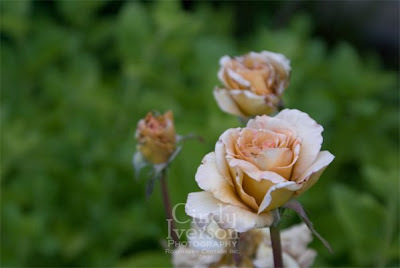 I think the Irish Creme rose has such a delicate and beautiful color! Oh they are beautiful. I can almost smell them all the way over here in England! Ours haven't yet started blossoming and are currently being attacked by aphids/greenfly. Other flowers are blossoming though and the seeds that Mum planted are growing really well. Oh your Roses are beautiful, are they all scented? Jane. OOh......I adore flowers and these are gorgeous. I am so glad that I wandered into your blog. Lovely, lovely flowers. I just love the blue Iris- they are so nice with the rose colors! We're just staring on spring here so thanks for sharing those pretty roses with us. Still love visiting your site, little time at hand lately. The Miracle of the "Elsie Poppies"